Send 50,000 troops to the border on live fire maneuvers. 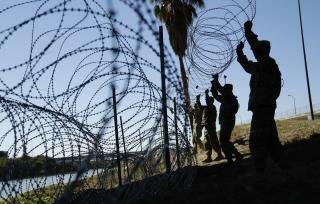 String razor wire at the mid point of the Rio Grande. Solutions are simple and we don't need congress. The military is now a prop in The Great Foldini's Emergency Political Theater. Another first. Excellent! Great news! Lock and load.